The show features GE Smith, Larry Campbell, & Jim Weider with Special Guest Taylor Barton on Saturday, October 18 at 8 PM. October 7, 2014 - Sag Harbor, NY - Bay Street Theater & Sag Harbor Center for the Arts is pleased to announce MASTERS OF THE TELECASTER, A NIGHT OF ROOTS ROCK N’ ROLL with GE Smith, Larry Campbell, Jim Weider and special guest Taylor Barton on Saturday, October 18. The show begins at 8 pm. Tickets are available online at baystreet.org or by calling the Bay Street Theater Box Office at 631-725-9500, open Tuesday through Saturday 11 am to 5 pm. MASTERS OF THE TELECASTER is presenting a soulful night of Roots Rock n’ Roll, which looks back at rocks origin with Pop, R&B, and soul music of the 1960’s. The performers are GE Smith, Larry Campbell, Jim Weider and special guest Taylor Barton. They will be playing tunes by Lee Dorsey and Bo Diddley to Al Green, and of course the classic Roy Buchanan tunes like Sweet Dreams and much more. GE SMITH was the music Director and led the Saturday Night Live (SNL) band for 10 years. During this time he also toured with Bob Dylan for four years. He also helped Mike Myers write a song for Aerosmith for when they performed on SNL. GE Smith was sought out by major recording artists like Jagger, who, shortly after Live Aid, called Smith to work with him on his first solo album, She’s the Boss. During this period Smith also did a few one-off recordings and concerts with David Bowie and Peter Wolfe. LARRY CAMPBELL is a three time Grammy Award winning producer and multi-instrumentalist who has been a studio musician, recording music with other artists on their albums, and a respected sideman, performing as a backup musician in clubs and concert venues, since the seventies. In 2008, Larry was awarded a Lifetime Achievement Award for his instrumental work from the Americana Music Association. Over the past decade, Larry has recorded with Bob Dylan, Levon Helm, Judy Collins, Sheryl Crow, B. B. King, Willie Nelson and The Black Crowes just to name a few. As a sideman, Larry is probably best known for his time spent in Bob Dylan's band. Larry was a member of Bob Dylan's Never Ending Tour band. 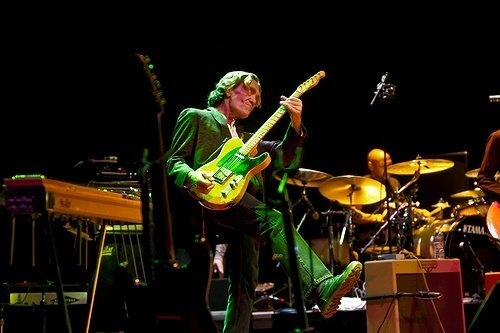 Since Larry's departure from Bob Dylan's band, he has continued to make guest appearances with various artists including Elvis Costello, Emmylou Harris, Phil Lesh, Rosanne Cash, Litte Feat and Levon Helm. JIM WEIDER is a master of classic telecaster and traditional blues slide guitar techniques. He is one of a select group of musicians to have an endorsement from Fender, and has built an international reputation among fellow musicians worldwide. He has performed with musicians like The Band, Bob Dylan, Doctor John, Keith Richards, Hot Tuna and many more. TAYLOR BARTON learned her trade in the presence of musical royalty. Her husband, guitarist GE Smith, put the young songwriter backstage with musical legends like Bob Dylan, Neil Young and Jerry Garcia. She has released eight critically acclaimed CD’s, and won 10 of The American Society of Composers, Authors and Publishers Awards. Tickets are $35 and are available online at baystreet.org or by calling the Bay Street Theater Box Office at 631-725-9500, open Tuesday through Saturday 11 am to 5 pm. Subject: LongIsland.com - Your Name sent you Article details of "Bay Street Theater Presents Masters of the Telecaster: A Night of Roots Rock N’ Roll"